While the Eldrazi hit various Lovecraftian concepts in terms of the creatures' appearance, Shadows over Innistrad seems to be doing the other element of the Cthulhu Mythos: the fear of cults and aberrant worship, of dark mysteries and things that should not be known by mortal men. To me, this was always the more important side of the Mythos, and the scenario depicted on this card could fit in any number of stories. In Magic terms, this is an interesting sort of card, giving you a solid defensive card at the stages of the game you most need one, and possessing the potential to turn into a game-ending creature at the time you most need that. I would try it out in Delver-style decks as a defensive card against Zoo and an aggressive card against control (when combined with the trademark cantrips, and it seems like that's not even the only major application for it. A cheap blue creature that starts out as a simple Wall, but as you cast instants and sorceries, it slowly threatens to break free into the kind of nasty leviathan Blue is always threatening to summon, but can never seem to do so without jumping through all sorts of hoops. Compared to things like Island-Fish Jasconius or Kederekt Leviathan, I'd say this is a pretty good deal. 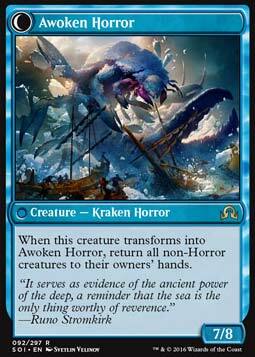 A Blue deck that wants to get a huge creature like that out is a control deck, as it needs to survive until the late game. Control decks like having instants and sorceries to lock down the opponent with, and also like having cheap creatures that block effectively and prevent the opponent from dominating the board. 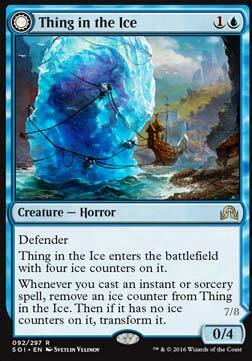 Thing in the Ice is a cheap blocker, and it transforms as a result of you playing instants and sorceries, so even untransformed it's a card you'd probably play and it rewards you for doing things you'd do anyway. Alternatively, you could attempt a "turbo-Horror" deck that seeks to drop this and then string together a quick succession of cheap spells to "ramp" your way to a 7/8 and a board-wide bounce even earlier than a Green ramp deck could hope to hardcast such a thing. Time will tell if the pieces are there to make it happen.